"A MOTLEY MIX OF WINSOME FOLK, BRUISED WITH BLUES AND INFUSED WITH BANJO. Sofiella & The Handsome Husbands are an independent 5-piece concocted through a mutual penchant for banjo twang and good whiskey. Their music swings between sweet harmony-heavy front porch folk, and foot-stompin’ hillbilly barn-burners. Sofiella Watt and the original Husband (Huckleberry Jim) formed their musical alliance during a rum soaked, swashbuckling existence on a remote Pacific island in the Tasman Sea. The acquisition of banjos then led them down the old timey trail to the mountains of Nelson, BC, Canada. A few years of rambling around and touring with their 5-piece outfit, The Huckleberry Bandits, carried the release of Sofiella's 3rd EP, which garnered a Kootenay Music Award for “Best Folk/Country/Roots Act”. 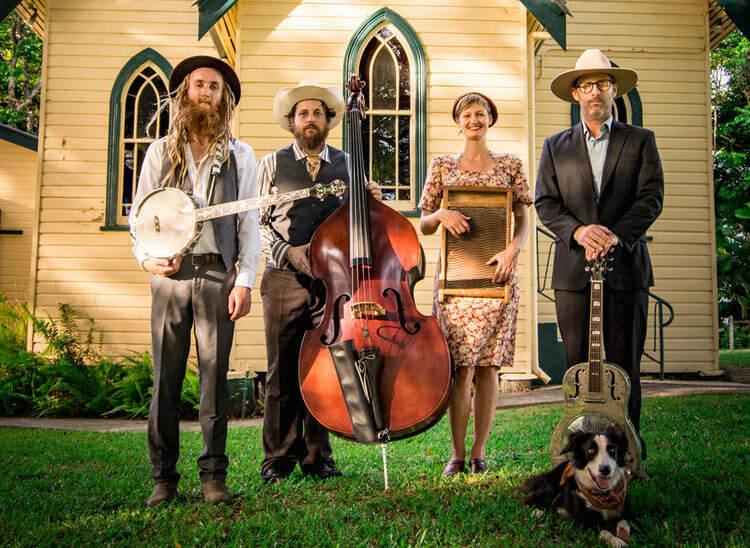 ​After supporting the likes of esteemed Canadian folksinger, Old Man Luedeke, and sharing the bill with bands such as Elliott Brood and Ozomatli, their wandering ways have found roots on a sleepy hill in the Byron Shire, NSW. Sofiella & The Handsome Husbands will be packing the van with banjos, washboard, guitars, double bass, viola and drums and coming to a venue near you. Do come visit. We promise we’re not a cult.